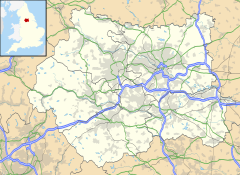 Scarcroft is an upmarket village and civil parish 6 miles (10 km) north east of Leeds city centre in the City of Leeds metropolitan borough, West Yorkshire, England. The village lies on the main A58 road between Leeds and Wetherby. It had a population of 1,153 increasing to 1,194 at the 2011 Census. The village of Bardsey is further 1 mile (2 km) eastwards on the A58 towards Wetherby. The Scarcroft Watermill was built in 1810 to grind corn. Toll Bar House, this was used between 1826 and 1876 when a toll system was in place between Wetherby and Leeds. There is one pub in Scarcroft, the New Inn, established in 1852. It was at one time called The Bracken Fox but reverted to its former name in 2011. The village's shop and post office have closed. The closest local shops are in Bardsey, Shadwell and Whinmoor. The closest supermarkets are Tesco in Seacroft and Morrisons in Wetherby. Scarcroft is also renowned for having among the most expensive streets in Leeds; Bracken Park - recently revealed as the most expensive - and Ling Lane, regularly appearing in top ten lists. ^ a b UK Census (2011). "Local Area Report – Scarcroft Parish (1170211003)". Nomis. Office for National Statistics. Retrieved 15 October 2018. ^ "Scarcroft Neighbourhood Development Plan" (PDF). leeds.gov.uk. July 2017. p. 59. Archived from the original (PDF) on 16 October 2018. Retrieved 15 October 2018. ^ "The New Inn". Vintage Inns. Retrieved 7 November 2014. ^ "Pub Review: The New Inn, Wetherby Road, Scarcroft". Yorkshire Evening Post. 31 March 2011. Retrieved 7 November 2014. ^ Behrens, David (23 December 2016). "Revealed: Yorkshire's three million-pound streets and the rest of the property rich-list". Retrieved 15 October 2018. ^ Bateman, Stephanie (9 October 2017). "Revealed: The 10 most expensive streets in West Yorkshire - Yorkshire Evening Post". Yorkshire Evening Post. Retrieved 15 October 2018. ^ Newton, Grace (27 September 2018). "These are the 10 most expensive streets in Leeds". Yorkshire Evening Post. Retrieved 15 October 2018. Wikimedia Commons has media related to Scarcroft. This page was last edited on 17 February 2019, at 06:51 (UTC).